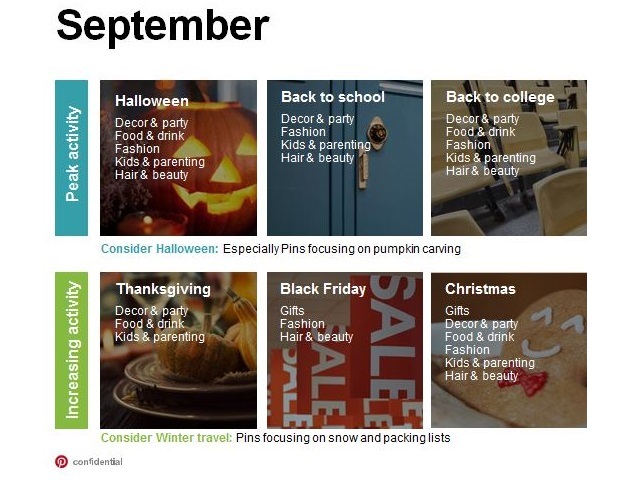 Pinterest users like to plan ahead for holidays and other seasonal events—way ahead—and the social network provided a planning calendar for brands and users looking to keep up. Pinterest said in an email to SocialTimes that 45 percent of its users begin planning for holidays at least 60 days in advance, 21 percent higher than the general population, with some starting the pin-saving process up to four months before the actual date and ramping up as it gets closer. Plan to reach your audiences at the best times with the best content. 70 percent of pinners take actions on pins. Pinners are twice as likely as the general population to celebrate events. Start event-related promotions on Pinterest before moving to other platforms to reach an audience with a planning mindset first. Take advantage of pinners’ long planning cycle by launching Pinterest campaigns well ahead of seasonal events. Don’t worry if you feel like you’re behind—pinners continue saving ideas for seasonal moments right up until the last minute.